About 10 years ago, when I had two toddlers under three, I dragged my sorry self into a holistic doctor's office. I could write an endless list of complaints I had at the time, but to sum it up, I felt like complete crap and thought that surely I must not be long for this world. After filling out forms and going through basic health questions, I moved on to a doctor-led dissection of my lifestyle. It was here that she pounced on our evening routine, which involved cooking two dinners—one for the kids and one for us parents—separated by an elaborate bedtime routine and all of it wrapping up somewhere around midnight, about five hours before the younger child awoke. The doctor looked at me in vague horror as I sheepishly finished describing all of this to her. "No wonder you feel the way you do! You're pouring all your energy into other people." She was right, and someone with a medical license didn't need to be the one telling me this. The truth was, the last thing I was trying to do was martyr myself—I simply love to cook and hadn't yet figured out how to be efficient about it. More importantly, having a later, adult dinner was a way to feel human and eat exactly what I wanted to, and enjoy the meal (and a glass of wine or two) with the other grownup of the house once all the kid toys were kicked to the margins of the room and the sippy cups were stowed in the dishwasher. But this daily slog was wearing me out more than it was giving me fulfillment. Fortunately, 10 years and another kid later, I've gotten saner about evenings, and that has enabled me to survive an increasingly complicated life. One of our crutches is getting takeout here and there; no shame in that! Another trick: teaching my older kids—11 and 13—how to cook, and assigning them dinner some nights (if you're going to have kids, you might as well raise helpers, right?). But then I have a few "something else recipes" in my back pocket: the tasty, wholesome ones that can be served two different ways, but which we all sit down to enjoy together. I serve them with punchy, add-on garnishes that instantly gin up the flavor for more sophisticated (or spice-tolerant on our case) adult palates. I'm all for getting away from the concept of kid food, but in reality some of the hotter, stronger flavors don't fly yet; I hope this will soon change. 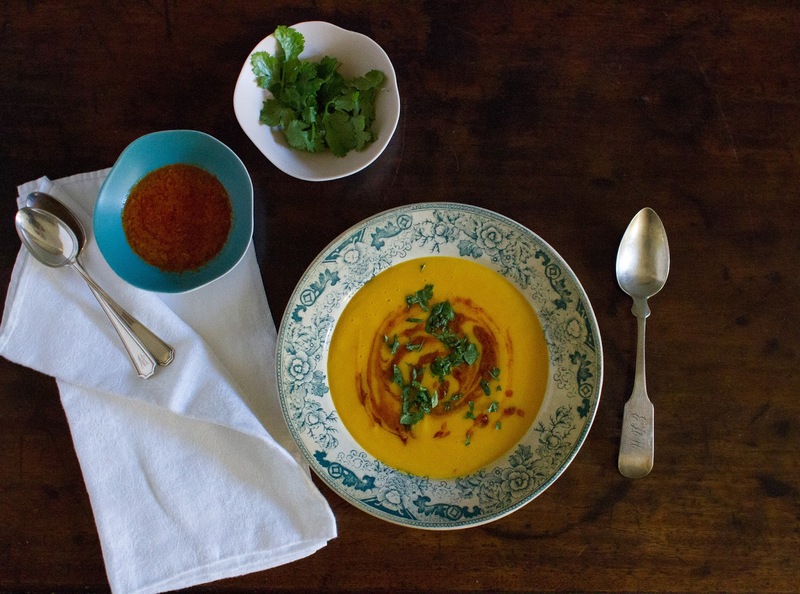 The soup recipe below is my new favorite fall "something else" recipe. It's also a change from the version I had on repeat for way too long, which relied on ample butter for comfort. The one below is vegan, but that's really just a side bonus. The flavor profile is tangy, bright, and clear and makes me believe it wouldn't be hard at all to give up dairy (for a day). To prepare lemongrass: remove 2 or 3 outer tough, woody layers and discard them (or reserve for stock). Chop off the dry, wispy tops and root end. What you should be left with is a long core that is still relatively tough but feels slightly damp and alive. Put this on a cutting board and with the blunt side of a large knife's blade, pound the lemongrass up and down on all sides to tenderize it. Now, with the sharp side of the blade, mince the lemongrass finely. In a large sturdy saucepan or Dutch oven, heat the oil over medium-high heat and add the onion and ground coriander, and a sprinkle of salt. Stirring occasionally, sauté for about 5 minutes, or until the onion is slightly translucent (do not brown). Add the squash and minced lemongrass and stir around a couple of times, then pour in enough stock to reach halfway up the vegetables. Bring to a boil then quickly lower to a simmer and cover. 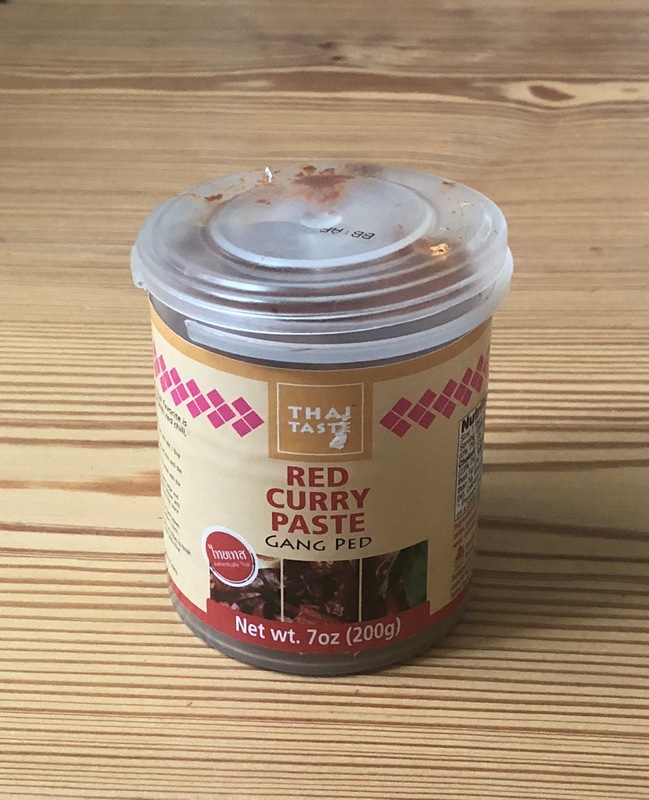 Meanwhile, make the red curry oil. In a small skillet, heat up the coconut oil for a few minutes. 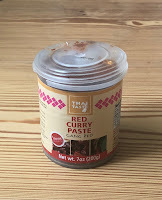 Add the ginger, sizzling briefly, then add the red curry paste. Cook, stirring, for a couple of minutes to bring the flavors up. At this point, add a few drops of water until the consistency is liquid (drizzle-able) but not watery. Reserve in the pan until you're ready to serve the soup. Simmer squash mixture for about 25-30 minutes total, checking occasionally. Stir in ginger after about 20 minutes. 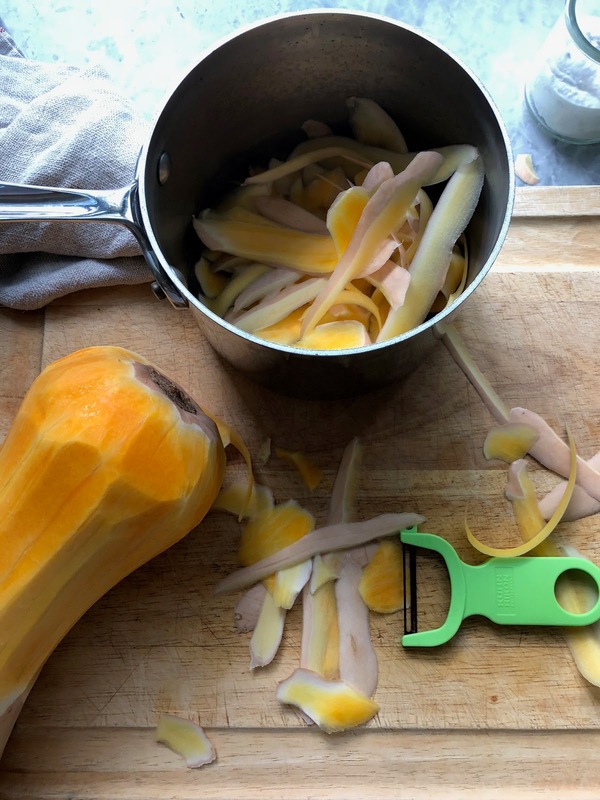 The vegetables are ready when the squash is soft and yielding when pierced with a knife, but not gone to mush. In a good blender, whir the vegetables and their liquid until they are velvety smooth with no lumps (do this in batches if it won't all fit in the blender at once—you can mix it together in the pot afterwards). Add the lime juice and 1/2 cup coconut milk at first (stir if separated), taste, then add more if you like. Rinse out the pot you used for cooking, then add back the blended soup and turn heat to low, adding more stock or water if it seems too thick. Important: now taste and add salt bit by bit until the flavors are where you want them. I don't like including precise salt measurements in my recipes, since everyone's tastes are different and the other ingredients vary. Serve soup hot in bowls, then swirl in red curry oil and scatter with cilantro leaves if desired. Offer extra garnishes at the table. *Stock-making tip: You can make your own vegetable stock, using the peels and seeds as a base. Put these in a medium pot along with the following: discarded lemongrass husks, a small chopped onion and/or leek, a smashed garlic clove, chopped celery or fennel, a chopped carrot, a bay leaf, a few peppercorns, and a strip of kombu (aka kelp - if you don't have it, that's fine!). Add just enough water to cover and simmer for up to an hour. 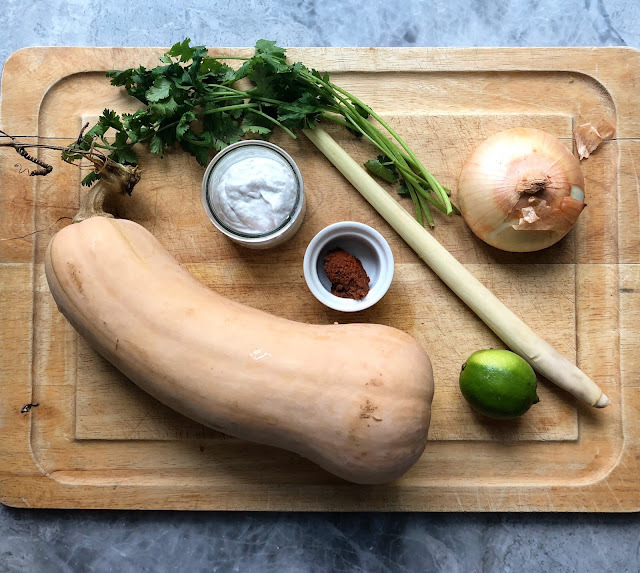 I love explorig different soup from different cultures, this butter nut squash soup ingredients look straight to the point. I will not waste much time before trying to prepare this for my family on the weekend.